Could the Pebble smartwatch be your entry to a totally connected world? Look around. What do you see? That's right. Things. Big things, little things, medium sized things - and increasingly, intelligent, internet-connected things. But what happens when everything around us is talking to everything else? It's called the internet of things, and as Patrick Goss explains, it's either thrilling or frightening. "The internet of things is the frankly horrible term used to describe the millions of devices that are now connected together and to the internet," he says. These devices "do not require humans to tell them what data to share." The things could be fitness bands or fridges, and they could represent "a hugely powerful shift in the way that we live our lives." As Goss points out, there are all kinds of possibilities. Networks of streetlights could monitor themselves, predict failures and automatically order replacement bulbs, or report vandals to the police. Sensors in car parks could instantly find you a place to park. Heating, lighting and cooling systems could learn how to be more efficient and save you money. Wine cellars could help you choose the worst bottle of wine to give a guest you don't like very much. And the security services could use your devices to track your every movement, which they're apparently doing already. The internet of things is based on ever smaller, ever cheaper sensors, networked via Wi-Fi or low-power Bluetooth connections - and the same tech that's driving those things is also turning up on people's wrists. 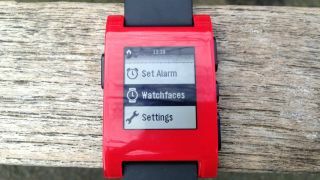 While some smartwatches have been pretty disappointing so far, Hugh Langley is thoroughly impressed by the Pebble. It may look like a watch but that e-ink display handles texts, tweets, Facebook updates, Google Maps, Snapchat notifications… it also controls your music and can accept or reject incoming calls. "Don't believe the smartwatch is here to stay?" Langley says. "Pebble is ready to prove you wrong." The Pebble smartwatch connects to your phone via Bluetooth 4.0, and there's a new, internet-of-things-friendly version of the Bluetooth standard coming to a thing near you. The excitingly named Bluetooth 4.1 will be pushed over the air to upgrade all existing Bluetooth 4.0 radios, and it'll enable devices such as fitness trackers to communicate with other sensors - heart rate sensors, temperature gauges and so on - and then report back to your phone. It will also enable devices to use your phone's features, such as the accelerometers and gyroscopes you'll find in many smartphones, and there's a new channel that will enable 4.1 devices to create massive networks that connect to the internet. According to Kevin Lee that means you'd be able to "wirelessly control every Christmas light hanging on your house, and your neighbour's, and their neighbours, and… you get the idea." For now, such things are still in the fairly distant future - but we're about to see a whole bunch of tasty tech that'll go on sale much sooner than that. Yep, it's nearly time for the CES 2014 bonanza. As Michelle Fitzsimmons and Lily Prasuethsut explain, "we're readying ourselves for a glut of phones, tablets, laptops, gaming tech, TVs, wearables, refrigerators and whatever other home appliances companies can stick a computer into." CES 2014 runs from January 7-10, and we're expecting all kinds of goodies: new Galaxy phones from Samsung, possibly featuring flexible displays; new kit from Sony, ZTE and LG, a better look at the new Steam Machine consoles; stacks of tablets, 3D printers and wearable tech; a keynote from Yahoo boss Marissa Mayer; and approximately eleventy billion new TVs - a range that might even include a prototype 8K television, some bendy screens and a top-secret "something new" from LG. It's all kicking off in January, then, but of course before we head to CES there's the little matter of Christmas to think about. If you're stuck for ideas for ace presents to get your nearest and dearest, we've worked out the best tech presents for everyone from movie fans to gadget geeks - and if you're looking for ideas for your own presents, you'll find the ultimate Xmas wishlist right here.